Translated by Peter Behrman de Sinéty for The Cahier Series, QWERTY is the partially transfigured opening excerpt from Chevillard’s 2014 book Le Désordre AZERTY (AZERTY Disorder, or Disorder According to AZERTY). It’s an abécédaire ordered by the rows of the French keyboard—typical Chevillard humor, to arrange his chaos in a strict but arbitrary fashion. The English version follows the convention of its own language, reorienting the work towards an audience that not only speaks a different tongue, but whose fingers fly across their keys in different patterns. It’s this unique mode of cultural translation that Chevillard expands on in his preface, reinforcing the link between the cahier and the series to which it belongs: questions of translation, explored through all manner of fiction and non-fiction. 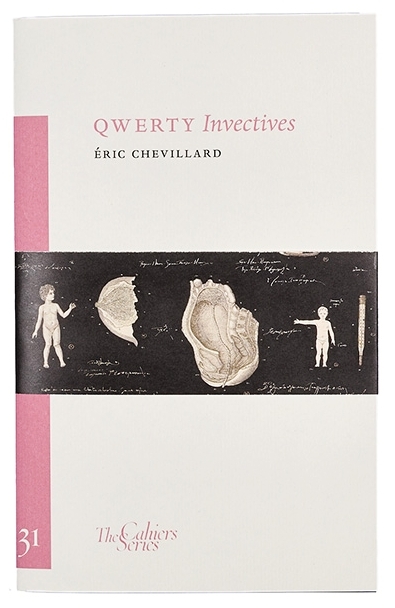 QWERTY certainly fits the bill, but Chevillard, known for his absurdism, does not draw the connections for you. In that sense, this may be one of the most difficult installments in the series, yet it won’t feel that way; it’s precisely his careful chaos, from the section breaks all the way down to the sentence-level logic, that gives Chevillard’s prose its captivating momentum. It’s hard not to follow where he leads. QWERTY’s narrator is a character spun from the prose itself. He passes himself off as an exaggeration of the author, but that’s only his jumping-off point. In one section, while decrying the excess of human waste in the world, our narrator indignantly recounts his own origins: “Ashes to ashes, dust to dust: that was the plan. For my part, it’s what I signed up for; these were the terms I committed to when I was given the opportunity to assume corporeal form. Nothing else was on offer.” We can hear the idea being worked up, teased out and expanded with each phrase, until it can’t be read merely as a sarcastic quip. Chevillard is daring the reader to take him seriously by whining, with sass and well-structured wit, about his own position in life. It’s part of the humor, of course, that the reader might pause to think through the details of this fiction: Was there paperwork involved? Are there non-scriptural options? But ultimately, we are no more inclined to incorporate this detail into our conception of Chevillard’s world than we are to understand his narrator as a cohesive character. The writing is idiosyncratic and self-interested, brimming with signs of life, but those signs are Chevillard’s most brilliant deception; it is voice that does the work of character. Though his narrator is inconstant, QWERTY’s most unifying subject matter is the real Chevillard, the middle-aged male author who self-consciously examines the dynamics of French culture and fitting into it, both socially and physically. Our narrator worries over his aging body and fears having it looked at—preoccupations that are common enough, but take on new consequences under Chevillard’s distractible care. One section begins as a lengthy contemplation of the dubious relationship between photography and truth-telling; the prose is animated by Chevillard’s usual amusing chains of illogic, but also by sincere inquiry. The narrator bemoans the death of the subject in the instant a photograph is taken—“Get away with you, that’s one horrific rictus!”—and eventually complains of his own disfiguration at the hands of photographers, on whom he naturally puts all the blame. He harbors an intense suspicion against the whole discipline of photography, and that suspicion is followed through again and again in different (always funny) directions. What really happens is that the day following the photo-shoot, the newspaper publishes, in lieu of the author’s portrait, a picture of a polymorphous (but still wholly unimaginative) pervert, a fat-face modelled in a lump of butter by the thumb of a gorilla! The wrong my photograph has done me is not inconsiderable. Can it really be this unacknowledged case-study in premature baldness, haggard, all chin, who intends to speak on behalf of my famously subtle œuvre? They must be searching for him high and low, those mortuary attendants! Who does he think he is, this usurper, this caricature, this pitiful plagiarist? The ruthless, cascading self-effacement—rather ingeniously translated by Behrman de Sinéty—reveals itself as a serious fear: the world wants something from Chevillard that he can’t give, or perhaps doesn’t have. Our narrator is always waging war against something, and for much of QWERTY, that translates to serious cultural critique. The section on photography, certainly, is not just a personal lament but also a spirited tirade against image culture (which convincingly sidesteps the topic of selfies). For most of the cahier, that outward-facing scrutiny runs parallel to whatever nonsense Chevillard is drawing our attention to, but there are moments where it drops out almost entirely. The third section, named for the narrator’s enemy, is the most insular—the most like a traditional story. It depicts a bizarre rivalry between the narrator and his faithful (but unfortunately, faithfully married: “my enemy cannot bring himself to leave his wife in order to devote himself entirely to me”), moronic enemy. Their saga is constantly flirting with allegory, but resists being read that way; it outlines the struggle between the narrator and a self-loathing inner demon, but as usual, Chevillard isn’t straightforward or strict about it. The confrontations between these two enemies, recounted one after the other for several pages, follow an interpersonal logic that’s frenetic and never quite reveals itself. We know that the enemy sends “news from his holiday resorts—lovely little insult cards from Mimizan Plage or Ibiza”; and also that “the words for butterfly, for flower, for star, and for genius are quite unknown to him.” With each of these dizzying details, Chevillard manages to dive deeper in both valences, the ridiculous and the utterly serious. Once again, the narrator’s preoccupation with the progress of aging is at the fore, as he details how his body is failing him. But we also witness, from an intimate vantage, the pain of something new and perfectly contradictory: the narrator is drawing spirals around his frustrating stagnancy, this back-and-forth that ravages him without ever permitting him to change. Even in death, he muses, there would be no escape: “My enemy would like to see me dead. He would then accord me his friendship, and my corpse would attend all his parties.” In classic Chevillard fashion, the terms have been twisted, the word “friendship” even tossed around—but the relationship remains exactly the same. Maybe we should have seen that morbidity coming, if Philippe Favier’s illustrations are any indication. They are really not illustrations at all, since they were not made specifically for QWERTY; but Favier’s combination of dark humor and mysterious ceremony is a fitting complement to Chevillard’s prose. Standing as a full-page visual introduction to the “enemy” section is one of the least humorous paintings in the cahier: a skeleton, bloodied head to toe except for the bright ivory of its hands, like an inverse Lady Macbeth. It seems to be mocking the warning it offers (who knows precisely against what), but the suggestion of pain is hard to ignore. It’s intended to reference Michael Jackson’s “Blood on the Dance Floor,” a punchy seduction song that takes itself a bit too seriously. Favier, like Chevillard, is drawing out logic beyond its extremes—no surprise, since the two have collaborated for several of Chevillard’s books. Favier’s other images in QWERTY include intricately diagrammed bodies and body parts, as well as cut-outs of photographs, meticulously arranged and often labeled in tiny white scrawl. Their details could have come straight out of Chevillard’s dreams—surreal, exact, amusing and self-aware—but their solid black backgrounds seem to curtain off something more sinister. Favier’s paintings are like the remnants of some lost archive, which might lend a sense of entrenched authority to the text, but QWERTY is concerned above all with the present tense. The authority of Chevillard’s narrator doesn’t come from any historical archives, real or invented, but from the confidence in his voice as he talks us into new worlds. Behrman de Sinéty’s translation is a masterful rendering of that voice into English, preserving the narrator’s scatter-brained but haughty self-assurance and the intensely linear energy of his language. Every sentence unfurls at least as carefully in the English as in the French, so that the narrator always sounds sure on his feet. This holds true even when the translation must go beyond the linguistic, quietly accounting for cultural differences without disrupting the narrator’s voice. Rentrée, the French term for the beginning of the school year and a culturally loaded concept that Chevillard berates in one section, is deftly introduced as a verb to enable the narrator to play with its forms: “Return home? Oh yes, let’s – shall we? You’d think it was our era’s new-found mantra.” In the French, those first two sentences are only a few words, but since both the wordplay and its concision are impossible to replicate in English, Behrman de Sinéty recreates that pithy tone of voice with a few extra, stylized words. Later on in the English, once the concept has been made abundantly clear, the verb is seamlessly replaced with the calqued noun itself, rentrée. Translation always goes beyond the linguistic, but QWERTY is an unusual case, and intentionally so. As Chevillard predicts (in translation) in his preface, it results in “foreshortenings, telescopings, even extensions—as meaning circulates down new-found conduits.” But translation is relevant in both languages; it’s in that marvelous way that Chevillard drives his stories, by reinterpreting terms and ideas that would normally be left to their assumed definitions. His writing does not always follow the rules of reality, but it is utterly faithful to the rules of language. In a bucking of literary trends (something the narrator urges “from time to time!”), QWERTY is not especially preoccupied with how language fails to account for the world around us. Chevillard’s playful, searching text is more interested in finding out what else language can account for. Margaret Grabar Sage studies literature and translation at Yale University. She is an editorial assistant for Music & Literature, and her journalism and poetry have appeared in The Yale Herald and Yale Daily News Magazine.